If you come face to face with a broken window in your home, you'll certainly want to replace it, but how do you find the right replacement window? Replacing a window isn't quite as straightforward as swapping out a light bulb, but if you know where to look, you can easily identify the manufacturer of your window, and find the replacement that fits your needs. Inspect the window that you need to replace. Look for a product label, serial number or logo. This information could be on the window sash, which is the frame around the glass. Alternatively, you might find this information etched into a corner of the glass. Some windows come with a standardized label from the American Architectural Manufacturers Association Certification Program or the National Fenestration Rating Council Certified Products Directory. If your window has one of these silver or gold labels, look for the manufacturer's code, which will be where it says "MFR CODE" or "CODE." You can search the code at either the AAMA's or NFRC's website to identify the manufacturer. Identify what type of window you are replacing since different manufacturers make different types of windows. Some common window styles include single-hung, which opens from the bottom; double-hung, which opens by tilting inward; horizontal sliding windows; glass block windows; projection windows that open away from the house; and picture windows, which don't open at all. Take note of what type of window you have. If your window doesn't fit into a common category, jot down the characteristics you can observe, like the appearance of the window, and the direction it opens, if it opens at all. Once you've gathered as much information as possible about your window, bring serial numbers, logos, window descriptions and any other relevant details to your local window supplier. A supplier should be able to help you identify the manufacturer and order an appropriate replacement. If the manufacturer is unidentifiable or went out of business, a window specialist can help you order a custom replacement. If you're tracking down a window on your own, either by searching online or in stores, be sure to know the difference between replacement windows and new construction windows. New construction windows come with a nailing fin that goes around the frame. This is where the window is nailed into a wall opening. For a replacement window, you don't need the nailing fin. You're looking for a window that you can install into an existing opening. 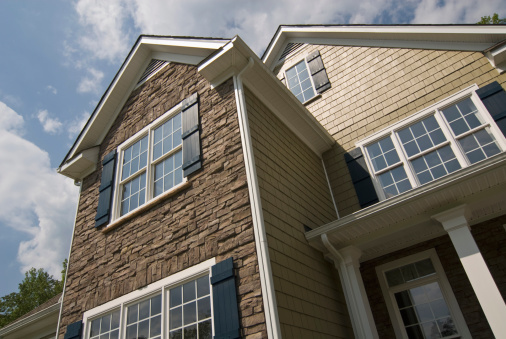 Just as the name suggests, new construction windows are typically used in new homes or additions. When replacing an existing window, a replacement window is the appropriate solution. Lauren Sieben is a freelance writer based in Milwaukee. Her work has appeared in The Guardian, Washington Post, Brit + Co, POPSUGAR and other outlets. Can Single-Hung Windows Be Installed Horizontally?